The Technic Fossil boomerang is probably best for teenagers above 13 as it is a little heavier than a child's boomerang. It is extremely durable and a great returner with a moderate toss. Remember to use a lot of spin and snap those wrists! For RIGHT HANDED throwers only! If you have any questions about this product by Boomerangs.com, contact us by completing and submitting the form below. If you are looking for a specif part number, please include it with your message. Plastic Bright Boomerangs (4 dz) by Fun Express assorted colors 10"
Speed Racer Fast Catch Boomerangs - Orange! Technic Gecko Decorated Boomerang - Fantastic Beginner boomerang for ages above 8 years old. Hummingbird Jarrah Finish Australian Wood Boomerang. Hand Crafted Wooden Boomerang made by an Austalian National Champion. BumbleBee Precision Boomerang - Easy Returning Boomerangs! 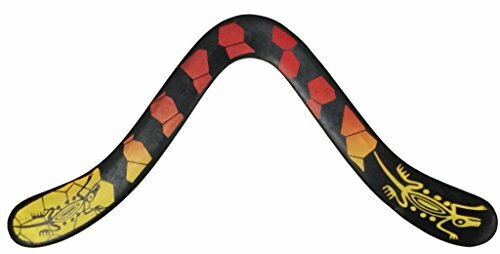 Polypropylene Black Mamba Boomerang - For Ages Above 10 Years Old! Aussie Fever Wooden Boomerang - Aboriginal Artwork, Made in Australia!